Large dog crates are needed for big breeds like Weimaraners, and you need to consider your dog’s future size, when purchasing one. 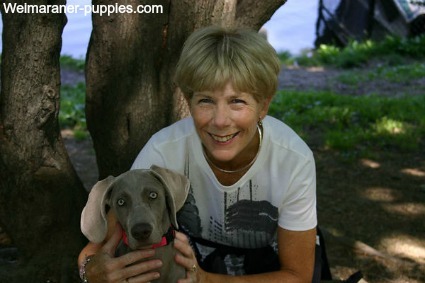 When you first bring your new Weimaraner puppy home, she will seem so little. It’s hard to realize how large she will become–and it’s also difficult to know what size dog crate she needs, NOW. So how do you decide what size dog crate to buy? Should you buy a small dog crate to fit your puppy now? Or one that he will grow into? If you plan to use it for crate training a dog, then you will want to have a little space in the crate–for turning around, stretching, playing with a toy. But, not too much space! If your puppy has too much space in her crate, she will use part of the space as her bathroom area. 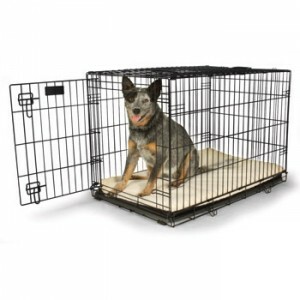 Large dog crates like this table dog crate keep your dog close without requiring constant supervision. 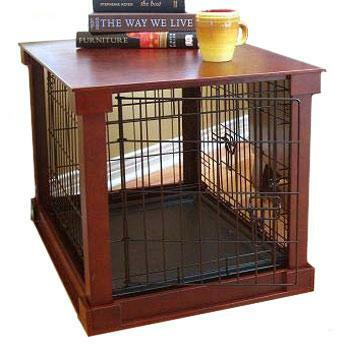 You can purchase this dog crate table at Wayfair here. 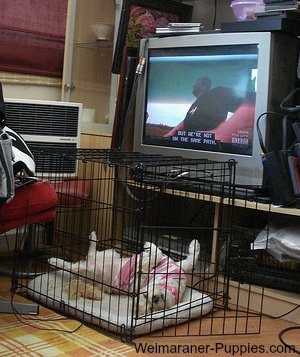 Dogs instinctively keep their living area clean, but if the crate is very large, they may designate one portion of the crate as “not living space” and use it for elimination. So, if you want to purchase an extra large dog crate that your Weimaraner puppy will grow into–what do you do? You can buy a large crate with a removable divider. 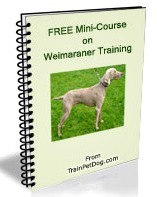 For Weimaraners, you usually need a crate that is at least 48“ long. When your puppy is still small, keep the divider in place. Your pup will be comfortable in the smaller space, and he will keep this smaller area clean. When you puppy gets bigger, and is house-trained, remove the divider and give him the whole area. At this point, he will be comfortable in the larger area and will not soil his large dog crate. Large dog crates can be simple, like this one. It could also be used for traveling. Purchase one now. 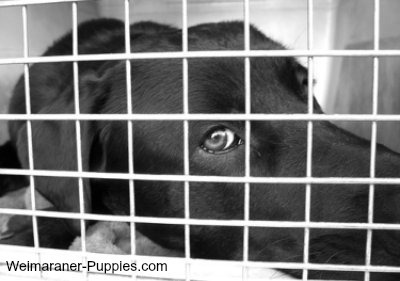 Many of the same issues apply when you buy a dog crate that will be used for travel or as a bed. 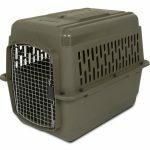 In this case, you might want to consider purchasing a plastic dog crate, especially if your dog will be traveling with you by air. A plastic dog crate is sturdy and protects your dog. A large plastic dog crate works nicely for travel. No matter what the purpose, your dog’s travel pen should be large enough that she can stand up and turn around–but small enough that she won’t use the rear of the crate as an area to soil. Another approach if you buy an over-sized travel pen, is to place something in the rear, so your pup doesn’t have extra space to do his business away from where he sleeps. Something as simple as a rolled up towel or two will work. Whatever you decide to do, keep in mind that your Weimaraner puppy will grow fast, and soon he will need one of the larger dog crates. In the meantime, you need to make sure that his crate is just right–for now!